Monday July 13th 1891 I was sick in the night and did not get up till nine oclock. There was a shower this morning. Cousin Ann got up and attended to my work. I sewed a little in afternoon. Tuesday July 14th 1891 Ann done the ironing this morning. I was doing some sweeping and extra work about the house. I sewed in the afternoon. The girls went to town awhile. 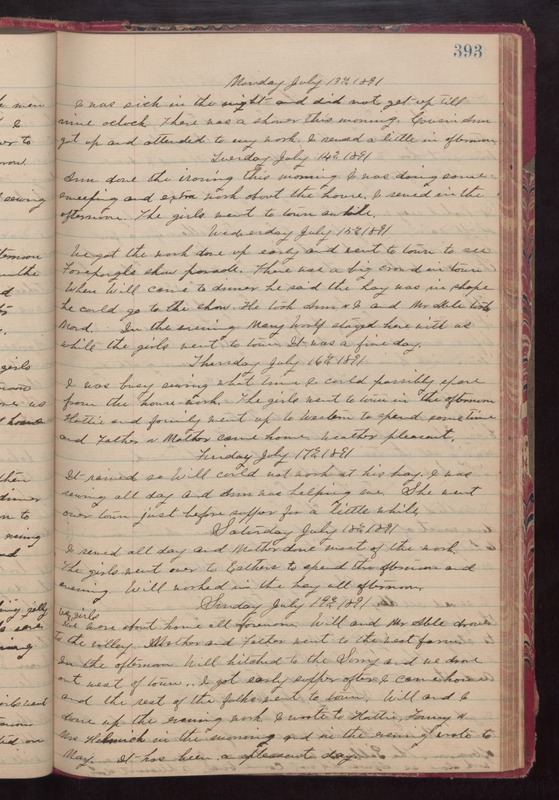 Wednesday July 15th 1891 We got the work done up early and went to town to see [Foreparghs?] show parade. There was a big crowd in town. When Will come to dinner he said the hay was in shape. He could go to the show. he took Ann & I and Mr Able took Maud. In the evening Mary Woolf stayed here with us while the girls went to town. It was a fine day. Thursday July 16th 1891 I was busy sewing what time I could possibly spare from the house work. The girls went to town in the afternoon. Hattie and family went up to Western to spend some time and Father & Mother came home. weather pleasant. Friday July 17th 1891 It rained so Will could not work at his hay. I was sewing all day and Ann was helping me. She went over town just before supper for a little while. Saturday July 18th 1891 I sewed all day and Mother done most of the work. The girls went over to Esthers to spend the afternoon and evening. Will worked in the hay all afternoon. Sunday July 19th 1891 We girls were about home all forenoon. Will and Mr. Able drove to the valley. Mother and Father went to the west farm. In the afternoon Will hitched to the Surry and we drove out west of town. I got early supper after I came home and the rest of the folks went to town. Will and I done up the evening work. I wrote to Hatte, Fanny, & Mrs Helmich in the morning and in the evening I wrote to May. It had been a pleasant day.